There are lots of weighted vests available in the market. Hundreds of brands and types. However you might be confused which one is the best for you. To help you guys, I have written this complete guide and have chosen and reviewed 12 top products here. A thing to note is the use of weighted sleeves is different from a weighted vest.If you are a woman then I would recommend you to read this post. I have talked in brief the best one for women. The sole purpose of a weighted vest is to add extra weight to your upper body for body weight exercises. These vests help to create an overloading effect on your body when you are walking, running or exercising.The main reason is to generate more force against the ground. According to research, it was that by adding more weight to your body while performing tasks like running, exercising or performing speed drills it creates an overloading effect which helps the body muscle to generate more force against the ground which will lead to gains in strength and power and even increases your acceleration in running. V-force is one of the most popular makers online. They mainly make weighted vests that are used by firefighters and military people. Don’t worry; you can use it too. This military grade product are very quite tough and sturdy. V-Force makes two types: one short and the other long. 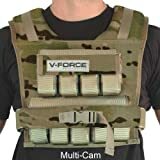 There is also a specially vest that V-force makes especially for basketball players. These are also made in the USA. 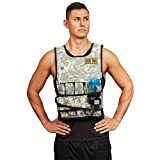 There are many models available on Amazon, the vests go up to 60lbs. You can also choose a wide and narrow shoulder option according to the tasks you will perform with the weighted vest. V-Force makes a ton of products from helmets to HDR lenses.They are a very reputable brand when it comes to these goods. Today we are going to focus on the 40 lbs one as it looks to be the best among the all. It looks good. You can get it on Amazon for patterns like Coyote Tan, Desert Marshall and the Uni Cam. The material used is triple layered Nylon. That’s tough. The stitching of the weighted vest is at par in comparison to others. The shoulder region is padded with the softer material; this is useful especially if pick up a lot of weights. This also makes movements easier. The fitting is also solid; you won’t slip off easily. It also comes with an attachment strap, which helps to get a perfect fit. Sweat Stopper Line – Similarly to the Box weighted vest, it comes equipped with a sweat stopper line. If you sweat a lot, this a nice thing. Maximises fulcrum effect – This helps you in targeted core muscles. This is useful if you are looking to buy it for advanced training. Support for many accessories – You add many accessories such as sweat stop liner, reflective bands and a hydration pack. It comes with a lifetime warranty. This means you need not worry about the product at all. The V-Force Weight Vest is the best weighted vest for men. After some rounds of comparison, we have selected it as the Number #1 Pick in the Top 3 for men. This heavy-duty, durable vest is made for any fitness enthusiast or a professional athlete. The vest is made of a double-layered reinforced 1000D Nylon. It also comes with an optional reflection band and hydration ready shoulders. With a five-star rating on Amazon, you should pick this beast up. It is arguably the top picks on the market now.People use it for walking as well. It is quite rugged and be used outside as well. Undoubtedly the V-Force Weight Vest is the best weighted vest money can buy. To check the rating of the vest click below. Read the full review. The major use of the vest is for someone looking to work on abs and the core. There are various models available to suit both beginners and advanced. The vest fits most people and comes in 3 styles – narrow,slim and perfect fit. There are many other styles apart from that. Apart from weighted vest the company also makes other types of weighted clothing such as shoes and gloves. It also has a vest designed only for women. Overall the brand can be trusted when it comes to weighted clothing. Read the full review. Our 3rd Pick is the ZFO adjustable Weighted Vest. The main selling point of this product is its affordable price. It useful for all those who are looking to build muscles and shedding pounds. This vest is very comfortable to wear. The look of the vest is very attractive unlike other kevlar looking vests. The upper and lower weight container can take loads of weight without tearing the vest. Even after this, there is a lot of space for arm movement. The vest is very useful for those who do a lot of push-ups, crunches and pull-ups. The ZFO Weight Vest is the nice vest for beginners. The vest is for anyone looking for an affordable product. Read the full review. Box are one of the many popular weighted vests manufacturers out there. These products are American made and implement the latest product technology, so you don’t stay behind. The foremost thing you will see when you check it on Amazon is the number of colours it is available. More than 12 colours are available on the Market, including colours like navy, orange and coal. We will talk about the 45 lbs box weighted vest which is the more advanced product that Box has to offer. These can be used for CrossFit and for advanced Gym BodyWeight Training. For those who are wondering about CrossFit, it is actually a high-intensity fitness programme incorporating elements from several sports and types of exercise. The weighted vest is designed as most others. It has a padded design. Such a design will really help if you are planning for crossfit. The size is 12″X12″ on front and back both. The material they have used is the 1000D Nylon Cordura. Easy to clean sweat lining – If you sweat a lot, don’t worry, it has an easy to clean sweat lining. So if you do long periods of training, it has you covered. You won’t find this feature in most of the weighted vests. Quick adjust BOX belt system – You don’t want a product to slide off or slip. 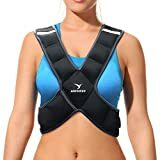 This can let to some dangerous circumstances The straps make the product fit tight, you need not worry about much movement especially if you are using it for running. Adjustable – You can go up 45 lbs on this one. Each increment is 2.5 lbs each. So you can adjust to your specified weight according to your usage. There are total 18 increments. Quick adjust clamp belt system is a life-saver. Most of the new box products feature narrow shoulders for comfortable operation and range of motion. You can use it for many activities such as walking, running, jumping or CrossFit. Because the weighted vest is short you can also use it for cycling. There is also an option to buy a longer product. It all depends on your usage.The 20 LBS BOX Super Short Weight Vest is mainly targeted to beginners. If you are looking for light tasks like walking and warm up, this should be the choice. You get a lifetime warranty with the box weighted vest. This shows how much the company trust their product. You need not worry about the product stretching or falling apart. Are you a woman looking for a weighted vest? If yes then this might interest you. This product from Empower is specially made for women and is quite cheap too. It looks cool and is shaped X. This design is very comforting. The material used is soft stretchy neoprene fabric. It comes in two colours, they being black and navy. The weights are evenly distributed to provide equal resistance while exercises. 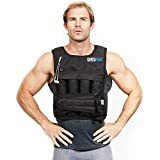 You can add more weights in the increment on 1 pound.There is an adjustable strap and a quick release buckle so the vest perfectly fits around your chest. It will fit women from sizes 2 to 15 and can be used for many purposes such as walking, running and cardio exercises. You can adjust from 4-8 lbs. It is made in a such a way that will fit women of all sizes and shape. Weighted vests can help you burn more calories in less time. The vest will really help you to better your lifestyle.The vest also comes with a small pocket which you can use to keep keys, music player or a small phone. Overall this weighted is one the top one’s available for women. I recommend this one and for the price you getting this at , it is a sweet deal. 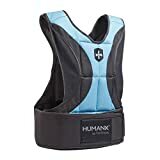 HumanX is another company that make weighted vests. So are they better than mentioned above or …? First of all, this looks very different from all others. The simplistic looks make it best for normal exercises. It comes in one size and fits most of the people. An easy-to-use neoprene tensioning belt is included for a customised fit. The overall weight of the weighted vest is quite less without any weights which are very to hard to found online. There is a shoulder/chest padding helps to increase the comfort and durability. It’s also torn resistant. The weights are custom impact-resistant which helps it to contour torso and stay it position. The great feature of the product that stands out is the sleekness and how it keeps tight to your body and won’t bounce when you run or do any other exercise which requires a lot of movement. The weights are either 1 pounds or 0.5 pounds according to your buying. Another great thing about the product is that your body remains quite free even after you tighten the weighted vest. This will help you do any form of training like boxing and wrestling quite comfortably. The product is that not too long, so it helps in exercises like squats. It deals with sweat and odour well. You get a standard warranty from the manufacturer. It has a 4.6 star on Amazon and has over 100 positive reviews. Cross101 is another great weighted vest on the market. Cross101 is not that big a name in the market. Apart from being the best rated one, it packs a lot of great features. The 40 lbs are more than sufficient for all the beginners. The pattern that it comes with is camouflage. It has an one-piece design. This means that it can easily fit anyone, you need to just tighten the straps accordingly. It is not that too bulky in comparison to others. You can add weight in the increments of 4 lbs. Each pocket has a nice velcro strap to ensure that the weights don’t pop out. The width of the vest is 13 inches and 15 inches in length. The Cross101 Weighted Vest is great. It is perfect for pull-ups, cardio exercises and push-ups. According to our testing, I would not recommend it to runners. Don’t tighten the vest too much or you will end up getting hurt. The Cross101 is also perfect for women. The dual straps make it easy for anyone to wear. Totally recommend it for long workout sessions. More than 300 people reviewed it on Amazon and it got a 4.3 rating out of 5. People really have loved the product and its features. The pattern is also a little different in comparison to others. 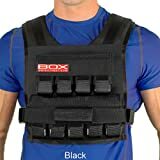 If you are looking for a weighted vest for push ups, pull- ups and other cardio exercises I would totally recommend it. 40 lbs are more than enough for most beginners. Not recommend to runners. You can check the price of this top product here. If you are looking for a very basic weighted vest then the Sklz might be a perfect choice.It maxes out at only 10 lbs. It is specially made keeping athletes in mind to improve their core performance. It has a mesh design for maximum breathability. It is made of reinforced nylon as most others. There is an adjustable velcro belt so it can fit most users. You can easily go for long runs and workouts without worrying about the fit. The soft bound edges help in extra comfort. It is a wide enough for shoulder and arm holes, unlike others. Similar to the Cross101 it has a one – piece design which means it can fit most body shape. Because the weighted vest is targeted at athletes it can hold weights up to 10 lbs at 0.5 lbs increments. This is very helpful for those who are starting new. The stretch pocket makes it super easy to add and remove weights. A great vest for runners and athletes looking for light resistance. It is great for Push-ups, Pull-ups, lunges, sprints, soccer, hockey and for various other sports. It has an overall rating 4.5 from 90 reviews on Amazon. Most people complained about sore shoulders when using for long periods. 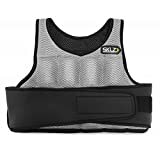 Sklz Weight Vest is overall a great weighted vest for beginners. Totally recommended to people looking to add light resistance to their exercises. You can check the price from here. 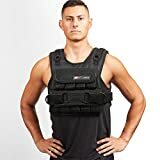 Perfect is not that a big name in the fitness industry but its Perfect Fitness weighted vest is one the few one with a 4.4-star rating on Amazon. There are two models of the product available. One is the 20 lbs model and other one is the 40 lbs. So either you are a professional or a beginner, you are covered :). The design is very simple. The vest contains a single velcro strap for the fit. The build is sturdy and it fits well too. The weights are made of sand. You can add weights in the increment of 1 pound in the 20 lbs weighted vest and 1.25 increments in the 40 lbs one. The shoulders are padded, which is a nice addition. Overall the vest is great for cardio exercises and for the gym. There are better vests out there for sure. ​The front shell is breathable. The fitting is inspired by a body armour, a slim fitting vest. This means you can move your body easily. The materials is high visibility reflective one’s which makes it road ready. It also hosts a dedicated pocket for a media player for all those music freaks, who can’t exercise without listening to music. A dual belly band in the weighted vest ensures athletic fit and function. This might not be the best one on the market for the price but you can give it a try. Especially for a beginner who isn’t looking for a lots of features, This product from Perfect Fitness could be the right pick. RunFast Weighted vests are quite popular, let’s see if there are worth your hard earned money. There are two types of products from RUNfast, one with the shoulder pads and one without the shoulder pads. Extra weights are also included in the package. You can opt for the 12 lbs, 20 lbs, 40 lbs, 50 lbs and the 60 lbs. It comes with weights included. It is great for anyone looking to add resistance to their workout. It also covers all types of individuals, beginners as well as professionals. The vest comes in a universal size, so it will fit most individuals right. The dual straps help to get a perfect fit; it also helps to secure the weighted vest. The velcro straps are large and quite durable. This ensures that the product lasts for a quite long time. The waist straps are external, this means the weight won’t be resting on your hip. So most of the stress will be on your shoulders. You can use it for things like squats, walking and running too. It is perfect for body weight exercises too like push-ups and pulls ups. Overall the weighted is perfect in all ways. It is great for the woman as well. There are some issues with fitting as per the reviews on Amazon, so please check the fit in a store before buying it. You are also covered in the warranty department from RUNFast. 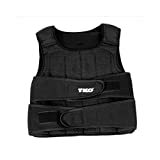 TKO is one of less popular weighted vest manufacturers online. TKO is a very big name in the fitness industry. Apart from the company also makes other fitness equipment and accessories. You can get the product in either in 20 lbs or 40 lbs depending on your experience level. The product design is quite simple. The material it’s made of is synthetic. In the 40 lbs version, you can adjust the weights in the increments of 1 lbs. The same is true for the TKO Weighted vest 20 lbs variant. The weights are made from soft steel unlike other weights made from sand. Stretch pockets are used to hold weights. If we talk about the design, it will make light. The vest features an ultra-soft gel foam padding for extra comfort and a lightweight, breathable mesh design. The two straps will help you to get a secure fit. The vest is quite comfortable too. It won’t move while you exercise or while running. It has the best mobility when compared to others. You could do light grappling or stand-up striking with this vest. Overall the TKO weighted vest is perfectly made. You can use while playing any sport or while just walking. It helps to add resistance to your body at the same time being light. You can either pick it up from TKO Official Website or Amazon. 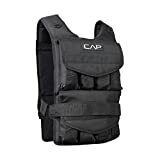 CAP Barbell Adjustable Weighted Vest comes at a decent price point and includes weights from 40 lbs to 150 lbs. This mean any person despite its size and usage can take one product of his choice. Using this vest you will be able to add strength training to your cardio workout. It will help you to burn more using the same exercises you do. Because it’s adjustable you can add weights according to your comfort level. The vest looks good and it’s quite durable too. It will last for years together without any issues. Overall it’s a great adjustable weighted vest. You can try it for sure as a beginner. You will find 4 types of CAP products and check on Amazon by clicking here.